The inspiration for the major motion picture 12 Strong from Jerry Bruckheimer, starring Chris Hemsworth and Michael Shannon. 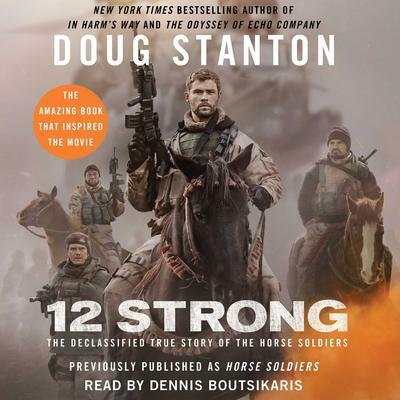 Horse Soldiers is the dramatic account of a small band of Special Forces soldiers who secretly entered Afghanistan following 9/11 and rode to war on horses against the Taliban. The bone-weary American soldiers were welcomed as liberators, and overjoyed Afghans thronged the streets. Then the action took a wholly unexpected turn. During a surrender of six hundred Taliban troops, the Horse Soldiers were ambushed. Dangerously outnumbered, they fought for their lives. At risk were the military gains of the entire campaign: if the soldiers perished or were captured, the effort to defeat the Taliban might be doomed. Until now the full story of the Horse Soldiers has never been told. Doug Stanton received unprecedented cooperation from the U.S. Army's Special Forces soldiers and Special Operations helicopter pilots, as well as access to voluminous after-battle reports. In addition, he interviewed more than one hundred participants and walked every inch of the climactic battleground. Reaching across the cold mountains of Afghanistan and into the homes of small-town America, Horse Soldiers is a big-hearted and thrilling epic story from one of our preeminent storytellers. Reaching across the cold mountains of Afghanistan and into the homes of small-town America, Horse Soldiers is a big-hearted and thrilling epic story from one of our preeminent storytellers.